This lab coat features four pockets, including two lower slanted band top-loading pockets, one chest pocket, and one welt pocket. It also features a four-button closure and a kick pleat. Center back length: 32". This shirt features a separating zipper, four pockets including one cellphone pocket, and inverted back pleat for extra movement. Center back length: 31". 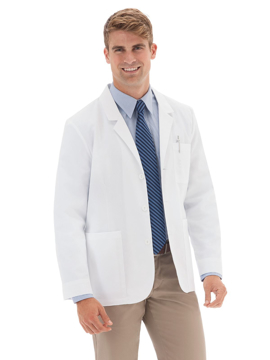 This mid-length lab coat features four total pockets including one inside pocket, hand access slits, pen pocket on chest pocket, and pleated back with sewn down back belt. This men's style complements the women's style #6150. Center back length: 34". 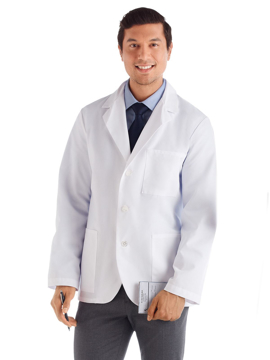 This lab coat features three mitered corner pockets, hand access slits, pen divider on chest pocket, and one-button swing belt. Center back length: 38". This lab coat features five pockets including one inside pocket, pen divider on chest pocket, hand access slits, and sewn down back belt with accenting darts. This men's style complements the women's style #651. Center back length: 40". 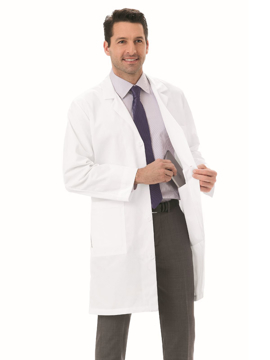 This lab coat features five pockets including two lower patch pockets one chest pocket with pen stitch, one inside cellphone pocket, and one inside iPad®/tablet pocket, hand access slits, and sewn down back belt with accenting darts. This men's style complements the women's style #763. Center back length: 40". 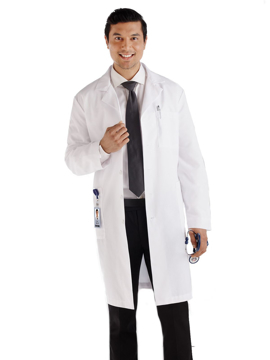 This lab coat features five pockets including two inside pockets, two-piece swing belt, pen divider on chest pocket, hand access slits, and scissors holder. This men's style complements the women's style #161. Center back length: 40". 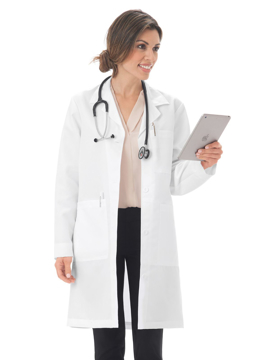 This lab coat features seven pockets total including two inside pockets, two oversized iPad®/tablet pockets with concealed inside pocket, and pen divider on chest pocket. Center back length: 30". This lab coat features five pockets including two inside pockets, princess back with belt, hand access slits, and scissors holder. This women's style complements the men's style #267. Center back length: 37". This lab coat features five pockets including one inside pocket, pen divider on chest pocket, hand access slits, and sewn down back belt with accenting darts. This women's style complements the men's style #650. Center back length: 38". 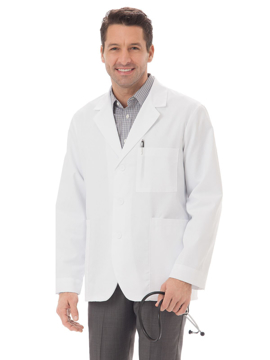 This lab coat features five pockets including two lower patch pockets one chest pocket with pen stitch, one inside cellphone pocket, and one inside iPad®/tablet pocket, hand access slits, and sewn down back belt with accenting darts. This women's style complements the men's style #762. Center back length: 38". This lab coat features two pockets, princess styling on back, and a center back belt. Center back length: 30". 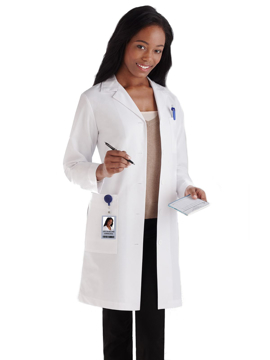 This lab coat features three pockets total, princess seams front and back, welt pockets, cellphone pocket, and embroidery details on cellphone pocket. Center back length: 36". 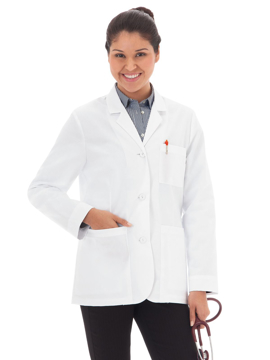 This lab coat features a two-piece back and sleeves, three pockets total. This men's style matches women's style #15104. Center back length: 30".